We are planning an ambitious new event for 2016. Medieval Music in the Dales will offer a weekend of all things to do with medieval music. Currently, the UK does not have an event solely dedicated to medieval music – which tends to get mixed up with the Renaissance, or even later periods, when in fact it has so much that sets it apart. 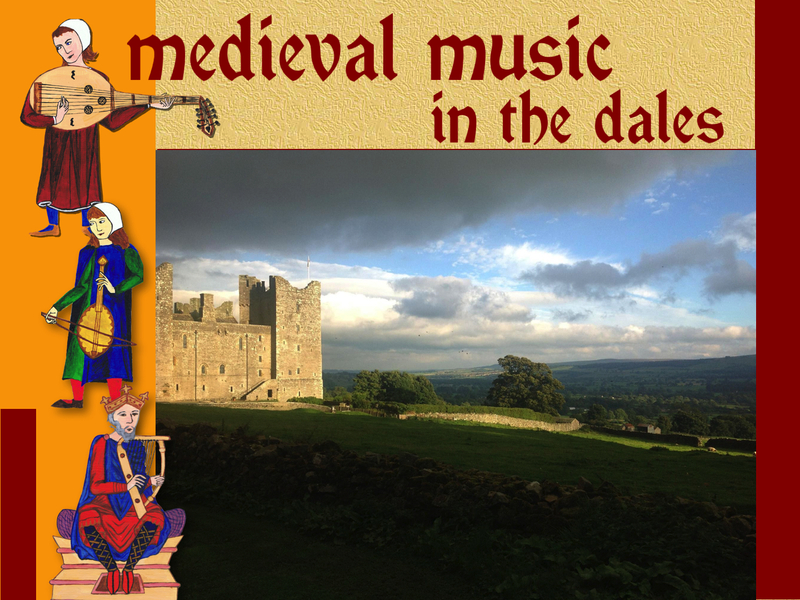 Medieval Music in the Dales (MMITD) will have a strict timescale for performance of 500-­‐1500. It will feature instrument makers who specialise in, or include in their range, instruments from this period. There will also be elements of living history, which will similarly stick to this timescale. And it will have the perfect setting… The fourteenth-­century home of the medieval Scrope family, Bolton Castle commands Wensleydale in a simply stunning setting. Though battered in the Civil War, a large part of the Castle remains fully intact, allowing for plenty of room for performance, displays, and eating and drinking. Participants in MMITD will be welcome to stay at the Castle or camp on site. Facilities are basic but it is a wonderful place to stay! A concert on Saturday evening – and maybe further concerts at other times. Visitors enter the castle on the first floor. From here they can either go into the shop and access the rest of the castle – or else into the tea room, which is one possible performance space for informal music. Going through the gift shop, visitors can access the Old Kitchen – a really excellent medieval space which is easily transformed into a medieval tavern – a further performance space where drinks could be available. Bolton Castle can even provide barrels of real ale! Going upstairs from the gift shop, visitors pass by the Chapel. This is now open to the elements but, weather permitting, is another lovely performance space. Staying indoors, one comes on the second floor to the Solar (right). This is a splendid large space, with the small Nursery adjoining up a short flight of stairs. The Solar will be the venue for the luthiers’ display. Along a short corridor lies the Great Chamber (left) – a truly majestic space which will be the venue for timed slots of music, and for the MMITD trade stall selling CDs of the bands and musicians performing at the event as well as offering publicity material for performers and luthiers. This is also the venue for the ticketed medieval banquet on the Friday night. It will also make a great location for dance workshops. Bolton Castle sits at the western end of a small villlage. 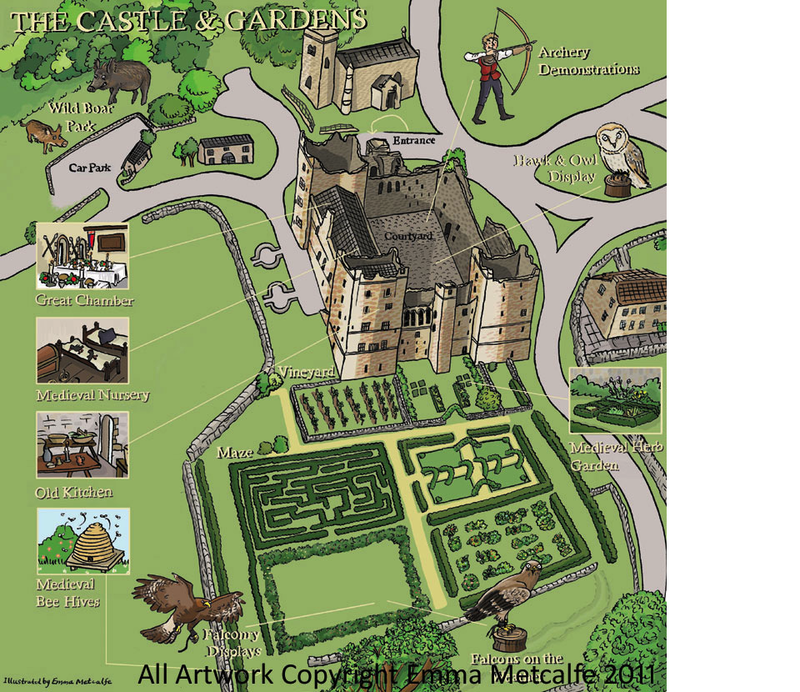 As the picture map shows, it has substantial gardens offering – along with the courtyard – plenty of space for the living history market – and indeed outdoor performance. The church can also be seen to the north of the castle – this is a possible venue for the concerts. There is also a village meeting room, which could house small workshops. This lies off the map on the eastern side at the far end of the village – it’s just a short walk. The car park is actually quite large – it’s not to scale here – and there is plenty of room for camping in this area on both hardstanding and grassed areas. We have already explored the idea of ‘Medieval Music in the Dales’ with some of the key performers and instrument makers from the UK and abroad and it’s gone down really well with everyone so far. We are confident that we can attract some of the best performers and makers to the event. More details of the line-up will follow – it’s early days yet but it is looking good! If you are interested in taking part or simply in coming along to MMITD then at this stage please join our mailing list or Facebook page to keep in touch with developments. Please do get in touch if you would like to take part in MMITD as a performer, luthier or trader! Or like the Medieval Music in the Dales Facebook Page: http://www.facebook.com/medievalmusicinthedales. NB – to get all updates on the page it’s advised to ‘like’ the page and then activate ‘Get Notifications’ from the dropdown menu under the ‘Liked’ button. This entry was posted in Plans and tagged Bolton Castle, early music, medieval, medieval music, Medieval Music in the Dales, minstrels, music festival, trouvere, Yorkshire, Yorkshire Dales. Bookmark the permalink. Medieval Music in the Dales – Time to Book Your Ticket!